"Why light projects with LEDs?" LEDs do not ever get hot. Ever. Incandescent which create light as a by product, they get hot enough to glow! LEDs to the rescue. You will not melt delicate artwork even if you leave the LEDs forever. 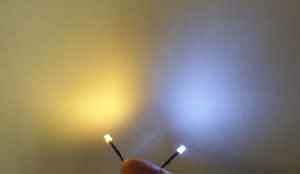 You can even "dress up" your LED with a plastic or paper shade, or paint it, no worries of damage. LEDs last and last!! Over 10 years: 100,000 hours! You won't ever have to take apart your mini creation to change out the lighting. 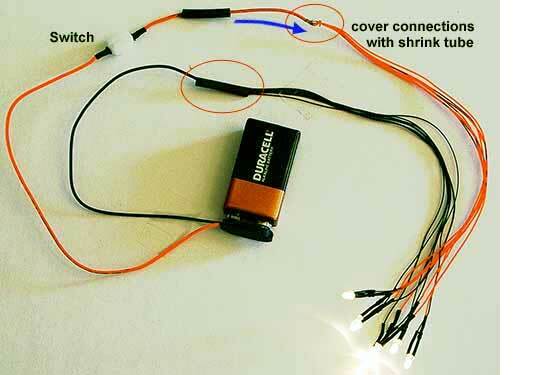 LEDs give lots of light in a very small package, you can fit lights into your projects! Even if the project is very small, we likely have the LED to fit. no need for a bulky wall transformer and a wall plug to light your project. Our LEDs are fully guaranteed for 2 years with free replacement. And in the many years selling these, we have had to replace very few. LEDs really do last. For years! "What power or battery do I use?" This means with a 3-volt coin cell type battery like the one in our mini light kit, you can run up to 10 lights. 6 lights will run approximately 24hours per coin cell. The coin cell we use is about the size of a nickle. With a 9-volt battery like a Duracell you can run 50 LEDs for 4 hours. Or run 5 lights for 26 hours per battery. 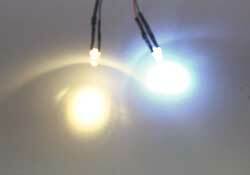 You can also run solids + flashing LEDs together with no carryover flicker on the solids. With a plug in power supply of 1 Amp you can run 50 LEDs for 10 years. No, LEDs never get hot. No matter how long you run them for. That is one of the truly great things about LEDs! We all grew up with incandescent which give light by heating up. You wouldn't touch an incandescent after it runs for awhile. And you would not want that incandescent anywhere near your delicate artwork or finished model either! LEDs to the rescue! You can leave your project lit up day and night for years if you want. The LEDs will never get hot. And never burn out either! "How can I use the 3 volt lights or 9 volt lights"
Click any picture to go to the page with that product The 3 volt lights are for 3 volts only. 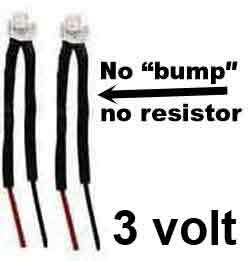 A 9 volt battery is just too strong and will destroy a 3 volt LED. Do not try it. 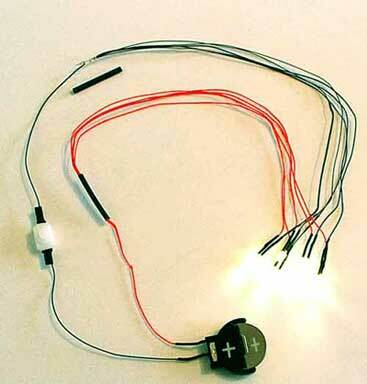 For 3 volt lights, get our 3 volt coin cell holder/switch with coin cell. 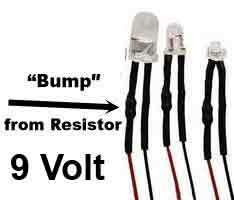 The 9 volt lights are made with a resistor for use on a 9 volt battery or regulated power supply. They will not be bright with 3 volt coin cells. 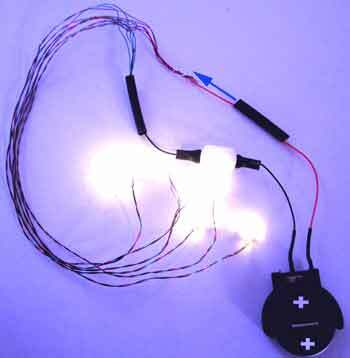 You can use our battery snap with switch for the 9 volt lights. "How do I connect my lights to power?" The general rule to follow is red-to-red and black-to-black. 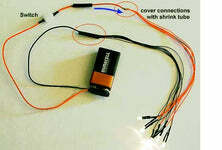 Twist the leads on your LED with the battery lead and use shrink tube or tape on the connections. "What do warm white and cool white look like?" The warm white is also called "soft white". Warm white is very close to what an incandescent bulb looks like. Warm white is a good choice for most interior rooms like living rooms, bedrooms, dinning rooms. Cool white is sometimes called "daylight". Cool white is a good choice for kitchens and bathrooms, or diners. We also suggest using cool white when the light is shining in a window from outdoors. "What do those size numbers mean?" LEDs come in many sizes. And the choice of size can be based on how much room you expect to have. In the ceiling or in a lamp, or outside a window. 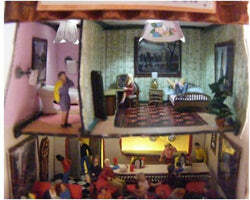 The largest size, 5mm is great for 1:12 scale, or for when you have a lot of room and need a lot of nice bright light. Depending on where it is used, even 1/4 scale can use 5mm sometimes. 3mm is the middle size. It is smaller than 5mm but bigger than the 1.8mm. Use 3mm when you need a round classic bulb shape. Popular with 1/2 scale, 1/4 scale and 1/12 scale. 1.8mm is our most popular size light for 1/2 scale, 1/4 scale and 1/144th scale. It is the light of choice for many miniaturists! The 1.8mm gives off a nice bright light and does a great job with light coverage. A very popular bulb! "Can I cut the brightness?" 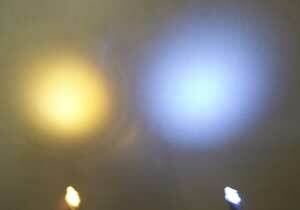 The easiest way we have found to reduce the brightness is with similar-color paint. enamel takes down the brightness 10-20 %. 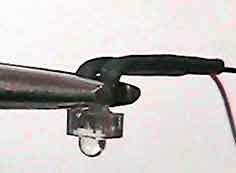 Or use a piece of shrink tube on the bulb to cut down side-light. Shrink tube can be applied directly to the bulb since the bulbs never get hot. Experiment with the amount of paint since you can always remove it and try again. "How do I fit my LED into a tight space?" The stalk of the LED, up next to the bulb can be bent 90 degrees for gluing to the ceiling (to have the light shine down) or for taping in behind a shade. Use a pair of pliers to hold the bulb stable while bending the stalk. "How can I hide the wiring in the ceiling?" After you bend the wire 90 degrees, make a "fake" ceiling out of stiff paper (Bristol board), punch a hole for the light. The glue the "fake" ceiling in place with the wiring headed in the directions you want it to go. (back, side, etc. )Or you can paint the leads and wires white like the ceiling and hide the wires with ceiling textures like plaster or use some tissue paper or other material. Generally ceilings do not get as close a look as floors do, so you can be more creative with your ceiling coating. Another benefit of gluing to the ceiling is you do not have to put a hole in the floor. "Making holes if needed ?" the base of the LED is square, which makes it a little tricky for round holes. When we drill the 5/32 hole we bend the stalk of the LED 90 degrees and tape it from the backside. This will keep the LED firmly in place. "Connecting wires for stronger connection?" 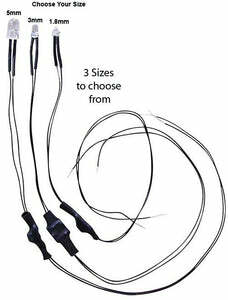 "When I am connecting red-to-red and black-to-black, how do I make the wires even?" You can cut the wires to even everything up. Then you will need to expose some new stripped wire for the connection. We recommend using a soldering iron to strip wires. Put the wire down on your workbench, put the iron on top, press down a little and then pull the wire out from underneath. "How do I hide the wires coming out? " You could use a small channel molding (1/4 ") to attach around the base, and then the wires and battery are taped underneath it. Cut either plexi glass or stiff plastic to slide in the molding. Or just glue the battery holder to the bottom of the project and tape the wires in place. Or put your LED wires under a fake rock. Or curl wires up as a hose after painting the wires green. Or put wires under a bush or potted plant. switch disguised as a mushroom! Remember to locate the switch in a convenient place. You can disguise the switch with a bit of something that matches the overall theme of you project. 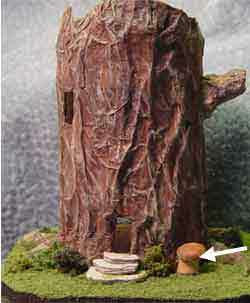 The switch can be put in a mushroom cap or small trash bin or under a plant. Or other creative ideas. The new smaller lights - can they be bent like the others?" Yes they can be bent any way that is convenient for your project. Go easy on the leads, bending repeatedly will break. Any metal can fatigue with repeated bending. "What power do the LED lights work with?" 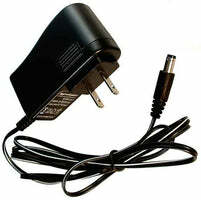 The all of our LEDs are available in 3 volt, 9 volt and 12 volt wall adapter / transformer. Check the package to see what the lights you have are to be run with. "I took my lights out of their packages, how do I tell the right voltage?" "What colors can I get?" We have red, orange, yellow, green, blue and purple. We also have a fire kit and haunting kit.Try some other colors for interesting effects! What if I break something, or a light does not work? How do I wire the new Chip LEDs? The chip LEDs have a green wire and a red wire. So now the green wire goes to the black on the coin holder or battery holder. And red still goes to red. And you will need to protect your connections with shrink tube or tape, to prevent a short circuit. How does sanding an LED change the light? sometimes it is nice to sand the top off the LED, to give a more diffused light when sanding, just sand to flat. Do not go near the metal you can see inside the bulb. My question is not here? Contact us we can help. And maybe list your question here! Copyright © 2019, Evan Designs.